My sister has a talent for finding expensive yarn in thrift stores. Sometimes this is cause for celebration, and at other times, lamentation. At first glance, I couldn't imagine what this strange yarn should be used for. My sister must've have thought the same thing because she gave a big bag of the stuff to my mom. My mom is not daunted by weird yarn. 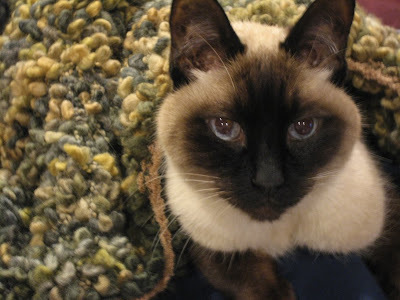 She knit a blanket, and it's kind of cool. Look how good it looks on Ziggy! Ziggy's been under the weather for more than 3 months now :( But, at least he's keeping cozy in this thicket of wooly boucle. I'm nearly done with a summer cardigan. I think these buttons look about right. Best of all, both the yarn and the buttons are from my stash. And, here's a little swatch of what I hope will be a simple, summer tank. I'm experimenting with combination knitting. I have a couple of wrong way decreases, but other than that, I like the results. 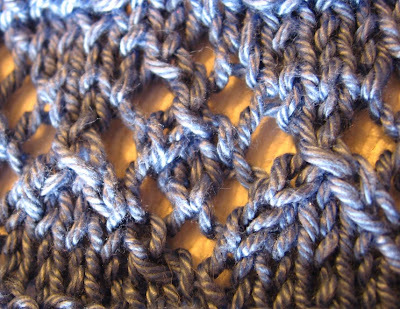 Learn more about combination knitting from Annie Modesitt and Grumperina. Karen, The cardigan is one of my own design. I have a first draft of a pattern, but it's on the back burner while I work on some other projects. If you'd like to know when it's available, you can email your contact info to frarydesigns at gmail dot com. Or contact me through ravelry. I'm beatknitter.